There are many things that work against you when you attempt to achieve daily blogging. However, the effort to maintain a daily blogging schedule is well worth it. I noticed that since I have missed a few days of publishing Small Business Odyssey, the Alexa ranking has changed from 860,000 to 1,100,000 – in other words, my web traffic has dropped. Daily blogging enables you to build momentum both with your writing and your blog traffic. Sometimes you may need an infusion of new ideas or a new perspective on your blogging. This can come through creating a related blog and using a drip-feed automated process. Whilst the membership site was pre-built in terms of its drip-feed content, I decided to develop audio content for the first 9 lessons via Audacity. Again, once I gained momentum in creating these recordings, I found the task easy and enjoyable. I was able to produce the audios (MP3’s) for the membership site on personal productivity in two sittings – one involving three recordings, the other six. The associated task of inserting the audios into blog posts was made so easy by the very clever, free software, podPress, discussed in an earlier post. So while I was not writing and publishing on my Small Business Odyssey blog, I was developing and refining my productivity membership site hosted on a WordPress blog. While the creation of the new productivity site may seem like a diversion from this blog, I believe that it actually reinforces the Small Business Odyssey blog. Personal productivity underpins much of what I am writing about on Small Business Odyssey. Fundamentally, if you can’t improve your personal productivity as a small business owner, you will have real difficulty engaging in any form of small business marketing. Worse still, you may end up doing the wrong kind of work (e.g. wasting hours on Twitter, reading and writing Tweets). One of the core challenges involved in daily blogging is, in fact, finding ways to improve your productivity. To make the time to achieve a daily, published blog post (a minimum of two hours taking into account locating images and editing), you need to find ways to improve your use of time. There are numerous things that can distract you or consume your time as a small business owner and it is easy to fall into old habits ( e.g. reading emails for hours) – with the net result that you do not make time for blogging. Over the past three weeks, for example, I have been engaged with others in creating four tender submissions for our human resource consulting business. a mind-numbing task but essential for business survival and growth in the current economic and political climate. It would have been very easy to give up daily blogging but I had to find a way to schedule my blog writing at a time when my productivity and creativity were at their best – early in the morning. 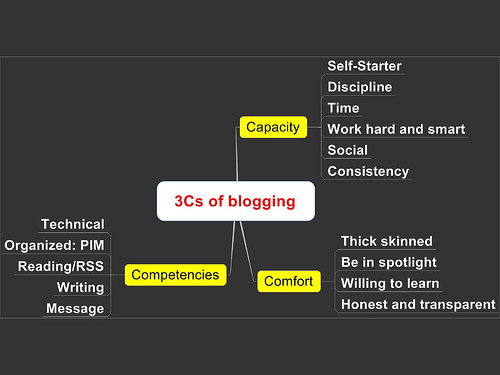 To engage in daily blogging, takes a huge commitment but it is rewarding both intrinsically (personal satisfaction and sense of achievement) and extrinsically (increased web traffic and income).